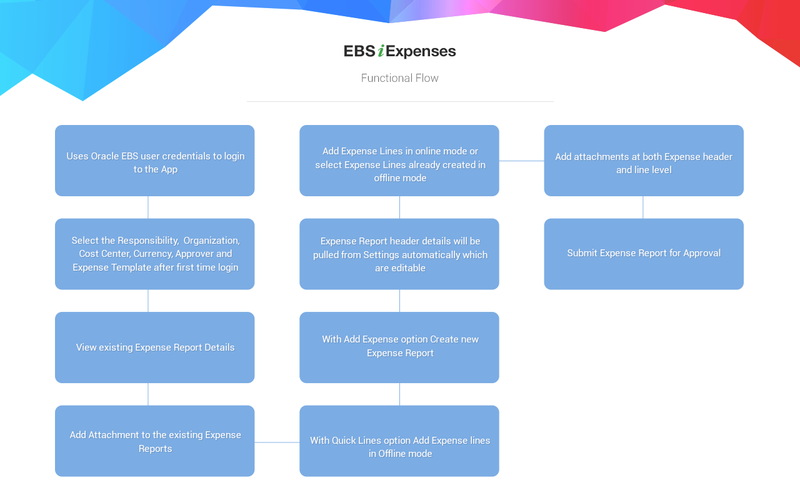 EBSiExpenses App works seamlessly with Oracle E-Business Suite to Streamline Expense Processing and Reduce Costs. Dramatically reduce the amount of time and effort required to View existing Expense Reports, Add Expense Reports in Offline mode, Attach Receipts to Expense lines and Submit it for Approval. Approvals are handled automatically using Oracle Workflow and Approvals Management. EBSiExpenses is totaly integrated with Oracle Internet Expenses module of Oracle Applications. EBSiExpenses is a Travel and Expense solution that streamlines and automates Travel spend Management. This App helps to increase Employee Productivity and Satisfaction due to the Faster speed of Data Entry, Use of Expense Templates, Ability to save reports in Offline mode, Captur Receipts image using Phone Camera and attach to the Expense Lines. EBSiprovides best solution for Business which makes the process of Submitting Expenses Reports easy for Employees. EBSiExpenses App is fully integrated with Oracle E-business suite 11i and R12. Provides ability to View and Submit Expense Reports using your Smartphones. User can enter Expense Reports in Offline mode and Submits it for Approval whenever they want. Allows User to capture Receipt image and attach it to Expense Line in Offline mode. EBSiExpenses is available for Free on the App store.